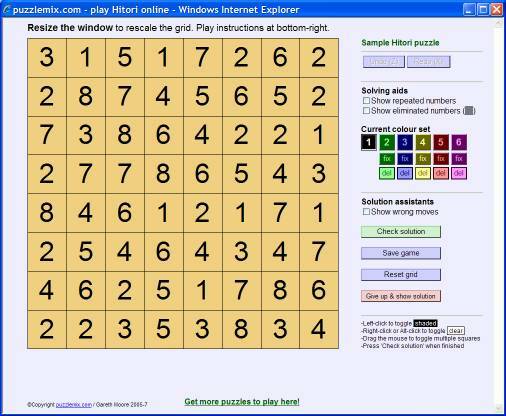 In Hitori you start with a full grid and must eliminate numbers by shading them in so that no number occurs more than once in any row or column. There is no requirement, however, to have each number occur at least once in a row or column (which would not be possible in a valid puzzle in any case). When solving Hitori it is often useful to mark in not only the shaded squares but also those that you know must be unshaded. On puzzlemix the squares start off unshaded but in a neutral colour (a muddy orange as shown here) and you can then shade in squares by clicking on them, or mark them as definitely clear (unshaded) by right-clicking on them (or by holding ALT and clicking on them). 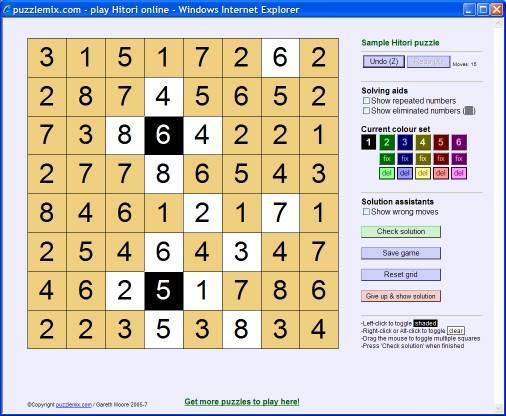 It's not necessary to mark squares clear to solve the puzzle, but it can certainly be helpful. 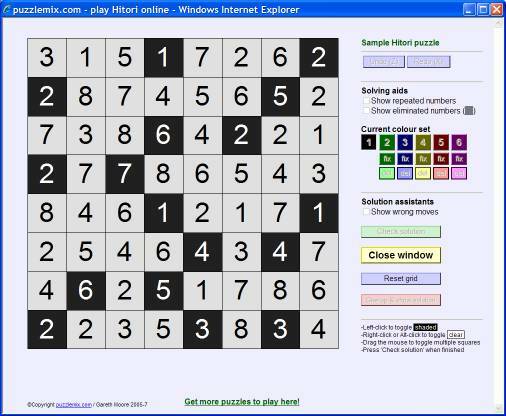 Look at the puzzle shown here. We can mark some squares as clear right away. In the top row there is the sequence 2, 6, 2. The '6' in the middle must be clear because if it was shaded then the two squares to the left and right of it would both have to be clear (since shaded squares cannot touch), but then there would be two clear '2's on the first row which is not allowed. So we can mark it clear right away. This and some other squares have been marked clear below. (There are others you can mark clear using similar logic too, such as the 7, 8 and 4 in the first column). On the right you might notice the ability to change colours when using the puzzlemix player. This is purely decorative and is intended to help you solve the puzzle - there is no difference between them so far as the correct/incorrect status of the puzzle is concerned. You might however use a different colour when testing out a particular hypothesis, for example, and then you can 'del'ete it to clear it if it is wrong or optionally 'fix' it if you decide it is correct. You can also always use the 'undo' button or press 'Z' to undo moves at any point, including deleting and fixing colours.